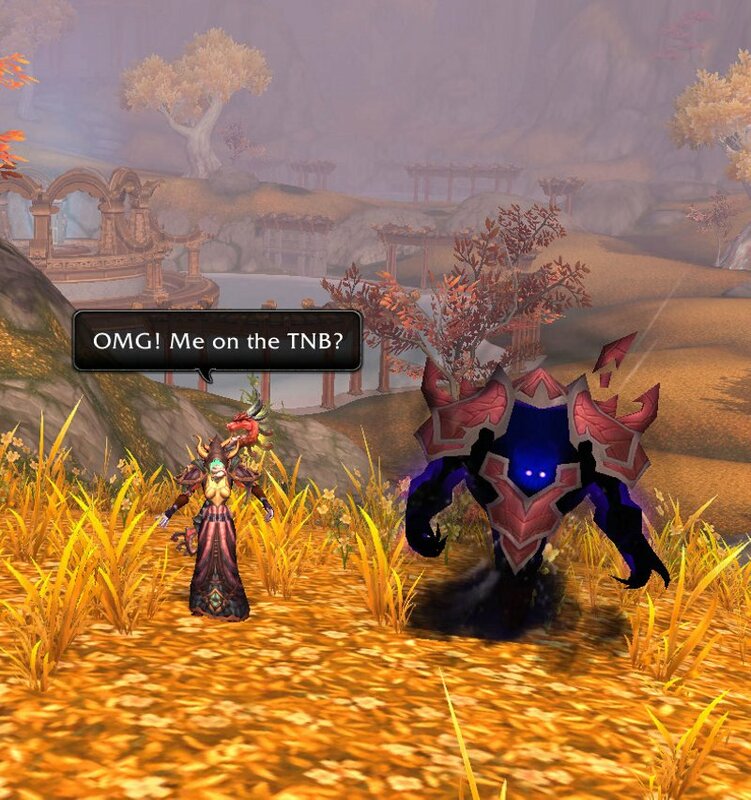 I was honored a couple of weeks ago by being invited to be a guest on the Twisted Nether Blogcast. Unfortunately, due to RL stuff I wasn’t able to make it on; however, today at 8 pm PST I’ll be making a complete fool of myself an appearance on the show :) Actually, I’m honored and very excited about going on the show. I have no idea why they chose derpy me, but I’m sure they’ll get annoyed with me quick enough to keep the questions very direct and short just to get me outta there ASAP. I just feel bad for all the viewers who will be disappointed they didn’t have someone else who might prove much more interesting! There’s many more qualified and entertaining people other than this old warlock, but I plan to have fun and hopefully not sound like a blabbering fool which is what I do best on “Live” broadcasts. If I use the word “amazing” more than 4x’s then you have my full permission to come to my home and kick me. I just hope Fimlys will be able to pronounce my name correctly :P and I hope Rilandune will be joining us as well. Maybe I can even get Hydrawr to do an on the spot re-enactment of her “Kick’em, Kick’em, Kick’em” line? If you would like to join us on the live chat channel please feel free to stop by via the TNB “Live” page. How can you not like a baby warlock? Okay, if it’s a gnome I see your point – but honestly, this is our future generation I’m talking about. Our legacy! So over the next couple of weeks, I’m going to be taking a closer look at our lower talents ranging from level 15 to 60. I’m seeing baby warlocks everywhere and I believe it’s up to all of us to make sure they’re just as hated, despised and despicable as the rest of us. Well, I survived going on the TNB and by my estimation I said the word “amazing” 146 times, the word “fantastic” 87 times, and the word “Um…” too many times to count. I think I also broke two records on the TNB. First, I broke the record for the longest and most boring person to interview. Second, I broke the record on how fast people switched off the show and moved onto something else. So I apologize to the TNB if they loose any viewers after having me appear! For me? I really enjoyed going on (despite my trepidation), and both Fimlys and Hydra couldn’t have been a more gracious host and hostess. We didn’t get into the warlocking stuff as much as I thought we would because whenever I’ve done any “live” broadcast I always forget what I planned to bring up. Gah! Derpy me! I plan to put together a special “thank you” for Fimlys and Hydra, and hopefully they’ll like it enough to maybe play it on the show. Omg, what’s with all of my “quote” words I’m throwing out on this updated follow-up? My lock is still sitting at 28 so I know I will like to hear more about low level talents. Not sure what I am doing. Anyway, thanks for the mention and I know we will work something out to get you on The Title Unknown Podcast too. Keep up all the great work. Grats on joining the world of the Dark Arts. A free toaster is in the mail and a full paid Jelly of the month club membership has been submitted with your address. Ha! You’ll be fine. Stick to the core abilities tab and try out the different talent choices to find what you like or at least get an idea of when you might consider using it. It’s just that easy! Her imp tanks, but that’s because he casts faster than she does. She keeps telling him to chill out, but imps don’t chill out so well. Well, I hope you get the new baby lock higher in levels. They grow in stature and in power, trust me. Sadly, imps will probably never chill out. They’re quite high-strung little devils, but once you get used to ignoring their snarkiness you’ll grow to appreciate their help. Even when you sacrifice them! Why were you chosen? Because you are ABSOLUTELY AWESOME! That’s why! Hats off to my favourite warlock and grats :) I can’t wait to hear it. Brave, stupid or just plain not right? I rebuilt my UI this week because I was getting 3 fps in LFR.. I chose to go with Elvui since it was recommended on Icy veins. Then I slowly started adding back the addons I consider essential. Raven for cooldowns and buffs etc. Autobar because hey, who wants to go rooting through bags for flasks and food ? And that’s it. NO combat text except blizzard’s. No meters of any sort. So, my advice for baby Warlocks? Don’t go overboard with addons. In fact, you don’t need all those I have either. Carbonite is very useful when levelling/questing, but you can use Forte for pretty much everything else and you probably don’t need DBM yet. I do recommend a bag mod though. If you don’t have ACP (Addon Control Panel) it’s a nice little addon that allows you to turn on and off addons on the fly and you can even save “sets”. I ran into the same problem with low FPS during raids so I keep things basic as well. You sounded great back on the 18th. Way to do Locks proud!